When we stuffed all our gear, luggage and a forum member we picked up at the Ring in my car for the trip back home after that first round, I started thinking about what would be the main topic of my article. I quickly settled upon two options. The first would be the track itself. An often ignored but important thing that can make or break an event for me. The other choice was a vague one, something I couldn’t really put my finger on. So I decided to write a complete article about the drift track, something that helped me define the second option better. And in the end, it can be described in one simple word: diversity. You see, the NDC is diverse in more than one way.  I already talked about the track with its very different corners. Now we’re going to talk about the cars. 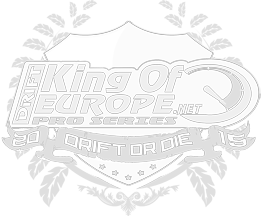 For example the Dutch drift championship, the NL Drift Series, is dominated by E30 and E36 BMW’s. 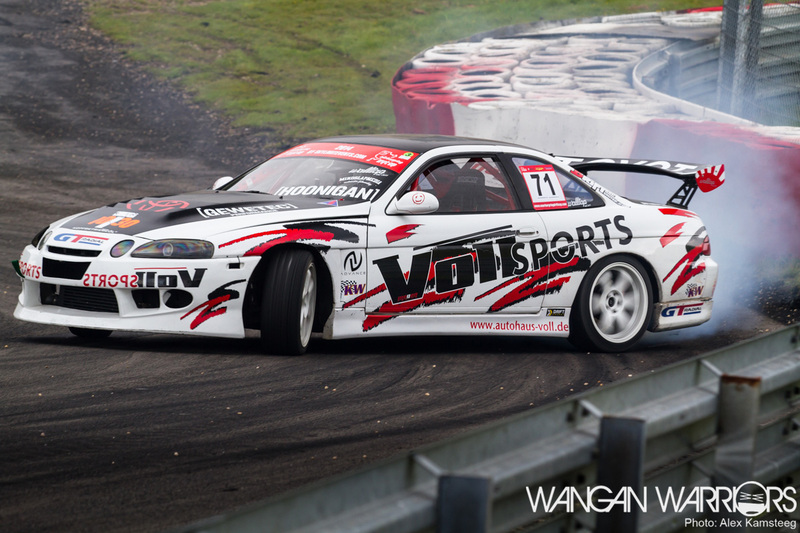 The British Drift Championship on the other hand has a field, as shown in our articles, packed with S-bodies. 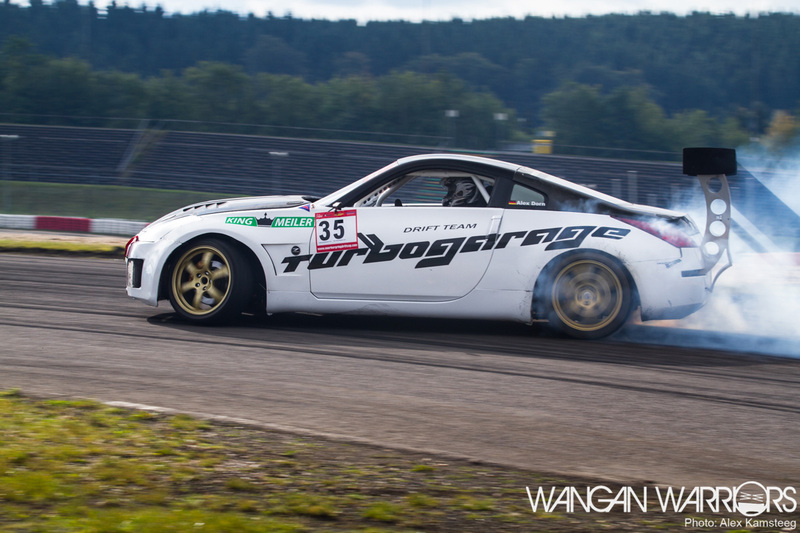 But at the Nurburgring Drift Cup there are cars from a wide range of makes and models. How many, you ask? Well, how about at least eight different makes from four different countries? Is that diverse enough for you? That diversity creates some interesting moments on the track. 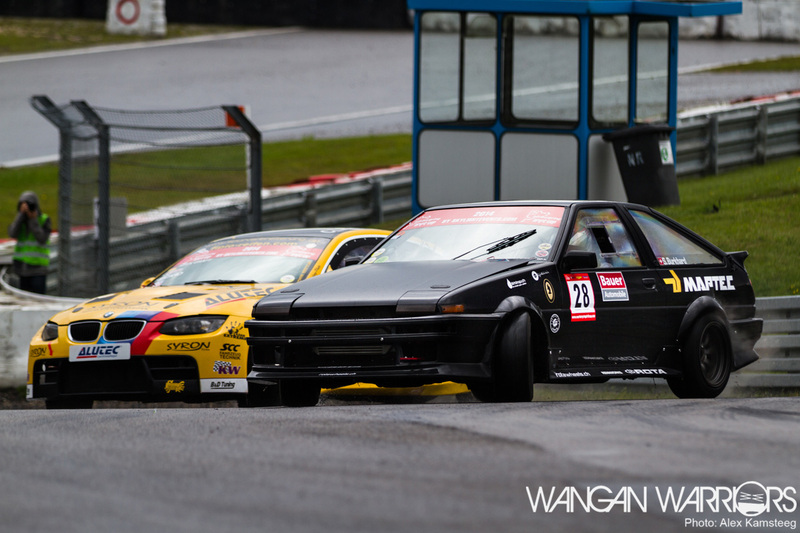 Big modern cars chasing oldschool ones, drifting door to door from corner to corner. Or two cars from the same brand, but the follower almost 20 years older than the leader. I loved it! The different cars enabled different driving styles too. Better yet, as I wrote in my article about the first round the track enables the drivers to choose different lines and driving styles. When two wildly different cars were battling it was great to see how much the chaser struggled to follow the leader, only to see the same thing happen on the second run when they switched positions. The cars itself often aren’t just one make or model. I jokingly called the NDC the Nurburgring Swap Cup because of the often surprising engine swaps. How about a BMW E92 with a V10 Viper engine? Or a Nissan S13 converted to pickup with a Dodge V8 and a Mitsubishi Gallant front? And for me that wasn’t even the most surprising car. 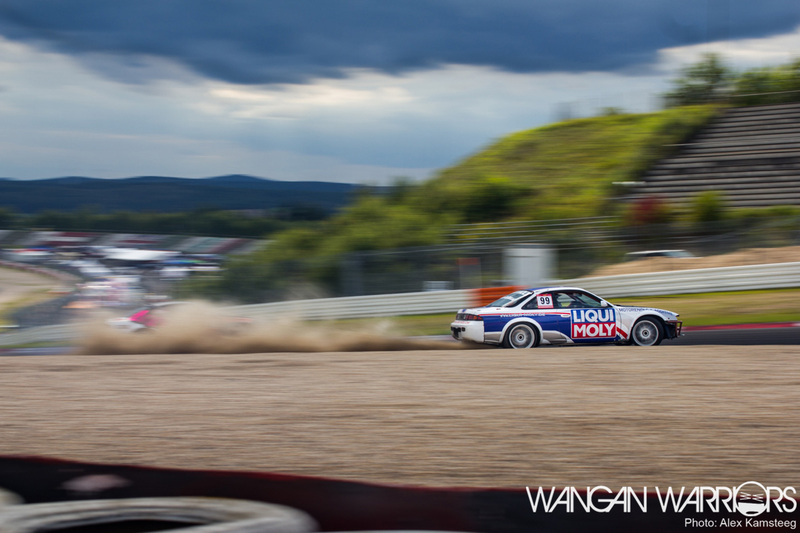 That honour goes to the very first Porsche built for drifting I’ve ever seen in real life. And of course the owner swapped the engine. Instead of the compact Porsche powerplant there was a big Chevy LSX-R hiding under the bonnet which sounded awesome and gave the car some serious speed. This diversity in cars meant some diversity in ‘smoke creating capabilities’ too. Before I start taking pictures I always spend some time looking at the cars on the track. What line are they driving? How fast are they going? And when I’m at a drifting event, how much smoke are they generating? The amount of smoke is often, but not always, a good indication of the abilities of both the car and the driver. For some reason some cars drift around the track at insane speeds and a nice angle, but with only tiny puffs of white smoke from the rear wheels. In the past I made the mistake of not taking pictures of these cars because they don’t look spectacular at first glance, but if you watch them for a few runs you start to notice how consistent they often are. Perfect run after perfect run, just like the crowd pleasers with the huge clouds of smoke but without the drama. And talking about those big clouds, other cars generate so much smoke they cover a large part of the track in it. Sometimes I couldn’t shoot the next car because the first car generated so much smoke I could only barely make out the track. And sometimes it causes difficulties for the driver too, with a cabin filled with smoke. Ah well, that’s just a minor inconvenience more than offset by the spectacle they create. And the combination of smoke and sun is perfect for both the onlookers and the photographers. 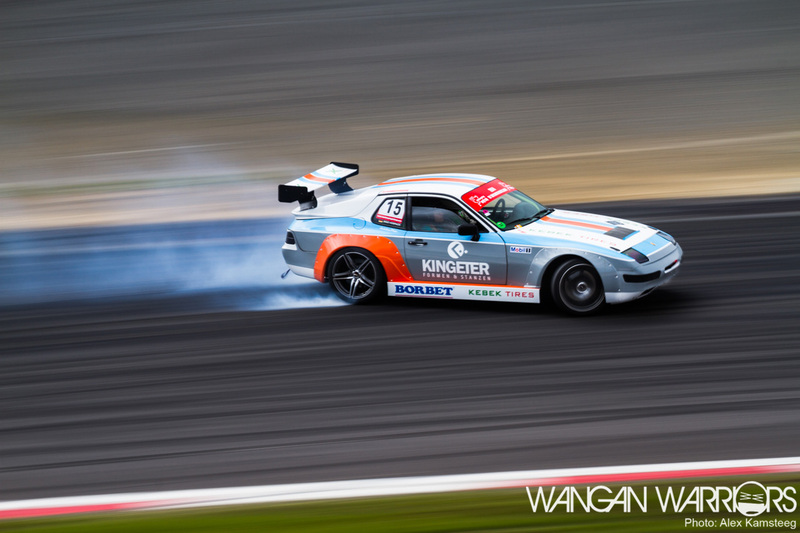 Especially with the diversity in wings on today’s drift cars. Although ‘diversity’ isn’t really the correct word. It seems like the choice is between big wings, insanely big wings and no wing at all. On the cars with the big wings you can actually see the aero at work. Often the airflow over the wing keeps the smoke down for a few meters behind the car. The lower pressure near the rear wheel wells also seems to draw the smoke out. These cars often have long clouds of smoke behind them. The rear of the cars with small wings or no wing at all is often completely enveloped in smoke. Sometimes even up to the handles of the front doors or even further. On high speed runs the smoke flows over the rear window creating two layers that merge somewhere behind the car. And that smoothly brings me to the conclusion of this article. I gave you a glimpse of the diversity of cars competing and when I was writing this I thought about how important that diversity is for me. And there’s only one answer to that: very. I want to see exciting battles between a tiny AE and a huge modern car. I love to watch a Porsche going uphill sideways. And last but not least, I really enjoy seeing that happen on an exciting track. And well, I wasn’t disappointed for two events in a row. The track is still awesome, the cars are amazing and everybody was enjoying themselves. And that last thing might actually be a good topic for a next article don’t you think? A bit of a behind the scenes about the crews, the drivers, the marshals, the judges and the photographers?